A familiar problem: more water storage is needed, but there is no room for a silo.To solve this problem, Bucon Industries realized a solution by placing a rectangular water silo under cultivation tables. Through installer Stolze from Maasdijk, a rectangular corrugated water storage silo was delivered to PostPlants in Pijnacker that was placed below the cultivation tables. The silo will be used as a water supply for a high-pressure misting installation. In the project Bucon took care of the assembly while Stolze Installatietechniek made the connections from the silo to the misting installation. The rectangular shape of this silo made it possible to choose any desired width. This is important when it comes to optimum utilization of space between the system posts. The silo is more than 17 meters long and 2.20 meters wide. With a height of 60 cm, the capacity is more than 21 m3. Naturally, it was fitted with a tensioning sheet to prevent algae growth and dirt from falling in. In this case, the silo was placed on a concrete floor between the posts of the transport system. If there is no concrete floor, it can of course partly be dug into the ground as well. That way naturally even more water can be stored. This specific silo is made for the storage of water for a high-pressure misting system, but this type of water storage can be used for many applications. For example for the storage of dirty or clean drain water as a buffer silo for sewage treatment equipment, as a daily supply or even for fish farming. 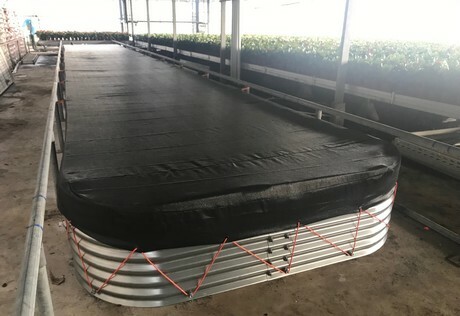 Because both depth, width and height can be chosen freely, this form of water storage can also work extremely well under other cultivation systems. For example, by combining this with a cover that can be walked on. A major additional advantage is that the water is stored at indoor temperature. Never too cold, never too hot. This makes the water much more suitable for use as irrigation water.